Although evolution through natural selection alone has been largely rejected, drummers for Darwin continue to claim it is essential. 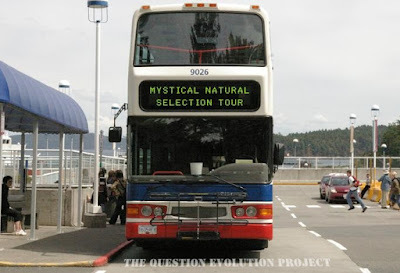 A spell back, we looked at how evolutionists were trying to predict a natural process and instead supported the Stuff Happens Law. Some other jaspers also inadvertently supported the Stuff Happens Law by claiming that it's not "fitness" that leads to survival, but just plain luck (see "Natural Selection? No – Sheer Dumb Luck"). Seems like evolutionists are appealing to luck with greater frequency. Mayhaps they're inspired by Clinton Richard Dawkins and his Mount Improbable foolishness. Keep reading, things are getting stranger. Some of the problems evolutionary scientists are having could have a simple explanation: they are unclear on the concept of natural selection. For that matter, scientists disagree on evolution (often attributing variations and minor changes to their blind, mad, gibbering god). It is an all-purpose tool used to explain practically anything in nature, behavior, and so on. Evolution gets too much credit, but it actually does not explain anything well at all. W. Ford Doolittle and Andrew Inkpen conjured up a new concept of natural selection that gets downright mystical. "It's the song, not the singer" — The process of evolution is of primary importance, and they base it on the nitrogen cycle, with hints of the false goddess Gaia. Sorry, folks, but Darwin was wrong, and so are his protegees. We were created in God's image. That's why evolutionary scientists are confused by things that just don't work. To read about this stuff, there are two articles submitted for your amazement. First, "Darwinians Cannot Agree on What Natural Selection Is". The follow-up is "New Version of Natural Selection Goes Mystical".